The Wired Equivalent Privacy (WEP) is a 64-bit key with 10 hexadecimal digits or a 128-bit WEP key with 26 hexadecimal digits. This encryption will prevent other users from connecting to a wireless network using your own WEP key. It will also protect your wireless transmissions/communications from being accessed or received by other users. 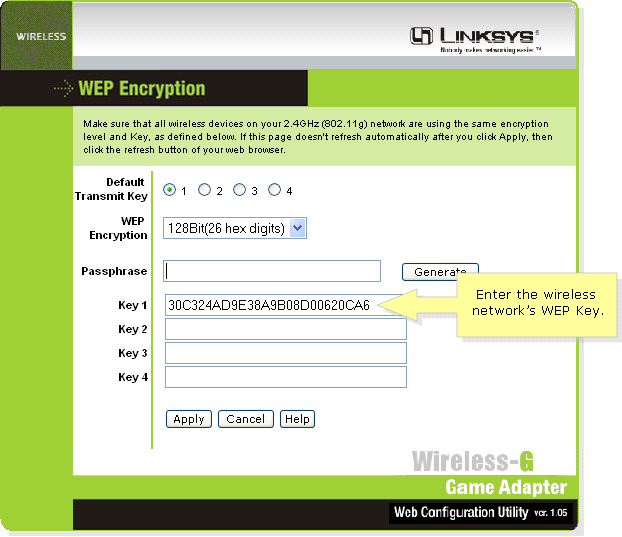 To setup WEP wireless security on your Wireless-G Game Adapter, follow the steps below. Access the Wireless-G Game Adapter’s web-based setup page. For instructions, click here. NOTE: If you are using Mac to access the Game Adapter's web-based setup page, click here. When the Game Adapter’s setup page appears, look for the SSID field and enter the wireless network’s SSID. Look for WEP, select Enable and click WEP Key Settings then proceed to the step below. When the WEP Encryption window appears, select the same Default Transmit Key as your router’s. In this example, we selected 1. 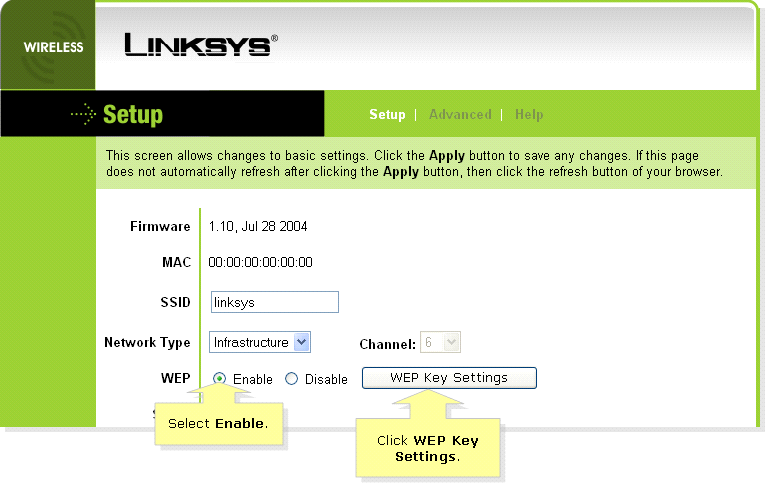 Enter the wireless network’s WEP key based on the Default Transmit Key selected. Since we selected Key 1, we’ll enter the WEP key in the Key 1 field. When the Setup page appears, click Refresh and select your wireless network’s SSID. Click Apply and you’re done setting-up 128-Bit WEP on the Game Adapter.